Is ice in wine a do or a don’t? I asked my Facebook group this very question and the overwhelming majority said ice in wine is a don’t, especially when out in public. But several admitted (as did I) that we’ve added ice to white wine that we’ve forgotten to put in the fridge. Is there an acceptable occasion to drink wine with ice? Oh yes! What’s your favorite poolside cocktail? Something fruity? A frozen drink with an umbrella? Well, how about something French? If you’re sitting poolside this summer, doing any entertaining, or just want to add some French flair to your next cocktail, I’ve got just the thing for you… and it’s refreshingly delicious. 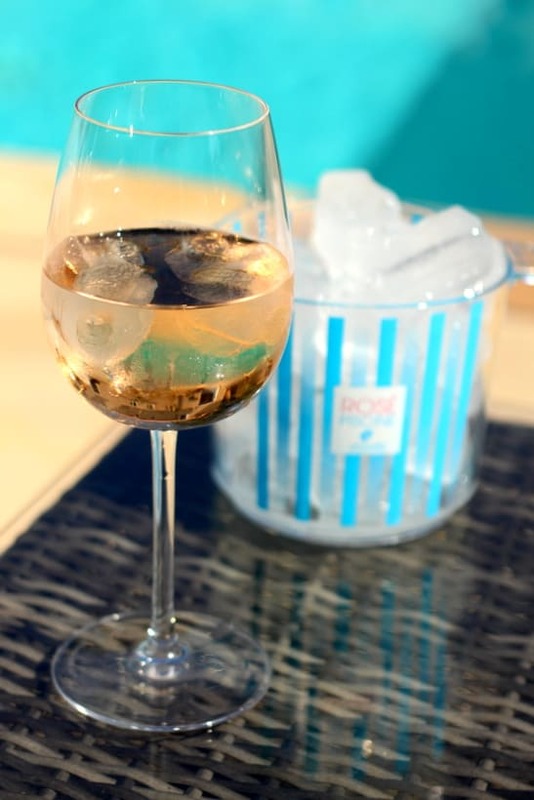 A Piscine (swimming pool in French) or rosé à la piscine is the name of a French cocktail popular in the South of France that consists of French rosé wine with ice cubes. French movie star Brigitte Bardot is thought to have coined the term Piscine after visiting Saint Tropez and being served the cocktail in a Cognac snifter. She remarked that the large glass looked like a swimming pool, a piscine, and the expression stuck. A big ol’ pool of rosé. Sign me up! 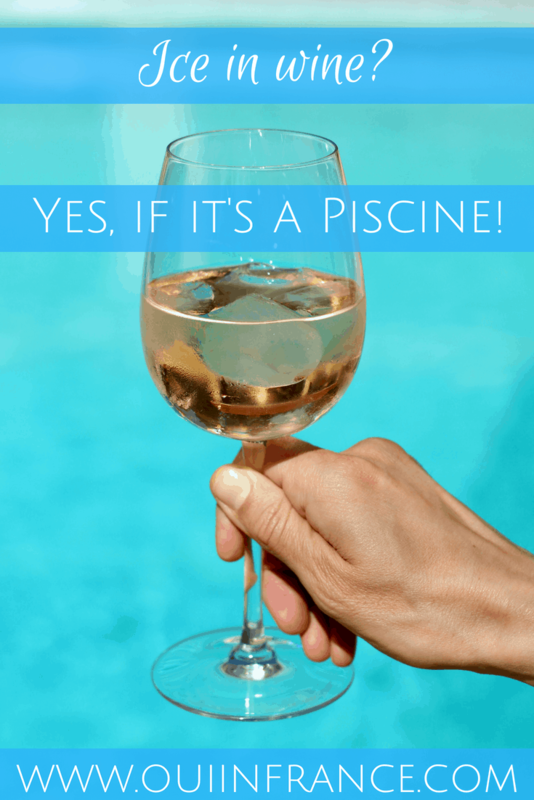 When I first saw a Piscine at a café earlier in the season, I knew nothing about it and assumed the ladies drinking their wine with ice just liked extra-cold drinks — isn’t ice in wine a faux pas? — or maybe the cafe had forgotten to chill the bottle beforehand. I didn’t think much of it and kept walking. As the weekend went on, I saw other people drinking rosé on ice and realized it had to be a thing. So to get some answers, I asked a bartender. Sure enough, I found out it certainly was a thing. She explained that they even do variations on the traditional Piscine by adding Champagne or a flavored syrup. Sold! I had to try one, so I did. Simple but fun, and oh so French. As I discovered, not only is ice in your rosé wine not a faux pas, it’s actually trendy! And that’s where Rose Piscine comes in. After getting home from my trip and Googling, I learned that there’s a brand of French rosé wine made specifically to be enjoyed over ice! I emailed them to learn more. 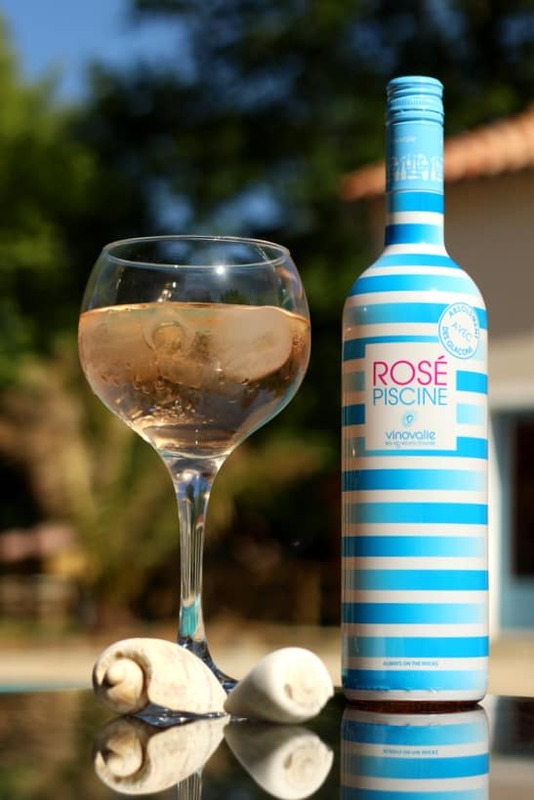 Rose Piscine is made in France — available in the USA, France, and Brazil — and the wine’s flavor profile comes to life with ice cubes. Yes, really! And oui, it tastes wonderful. Nothing sickly sweet or artificial about it. I personally can’t stand super sweet wines, so rest assured that this rosé isn’t one of them. Now, some of you out there are probably thinking that ice in rosé wine is a cool idea and that you can grab any old bottle of rosé and add ice to it. 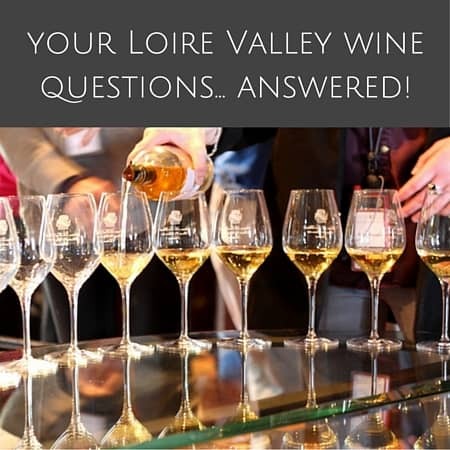 Technically, yes, you could put ice in any wine, but it dilutes the wine and the winemaker probably didn’t intend for the finished product to be served with ice. That’s not the case with Rose Piscine. Made with the tough-skinned, aromatic Négrette grape of Southwest France, this rosé wine is meant to be served on the rocks and tastes great until the last sip. It won’t lose its flavor or taste watered down once the ice starts melting. Another thing about Rose Piscine is it’s one of the few French rosés that’s made with the Négrette grape. 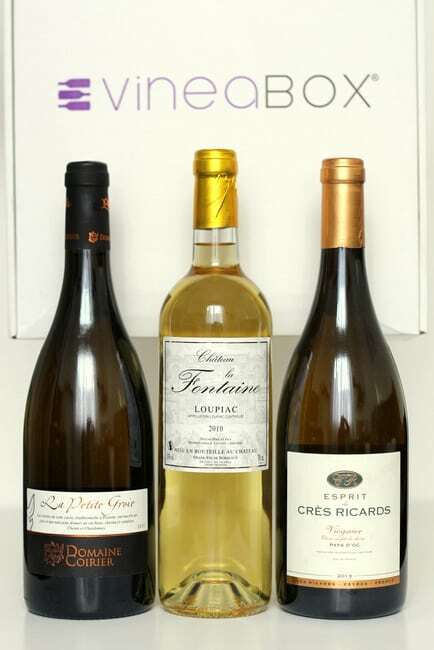 It comes from the Côtes du Frontonnais area just north of Toulouse on the western bank of the Tarn River. You’ll see that Rose Piscine is a pale salmon color, light- to medium-bodied, and has notes of Meyer lemon, peach skin, vanilla, kiwi, and Macintosh apple. On the palate, you’ll discover well-balanced tannins and acidity with a long finish. Basically, this is the wine for warm weather. And there’s no need to chill the bottle ahead of time since you’ll be adding ice to it anyway. For me, the Piscine drink is about more than just rosé wine. It’s about how you feel when life is good. It’s about making memories and sharing good times with those you love. The women drinking their Piscines that day in La Rochelle were relaxed and enjoying themselves while taking in the sea breeze. They didn’t have a care in the world. Whenever I pour myself a Piscine, I’m mentally transported to that place and it feels good. 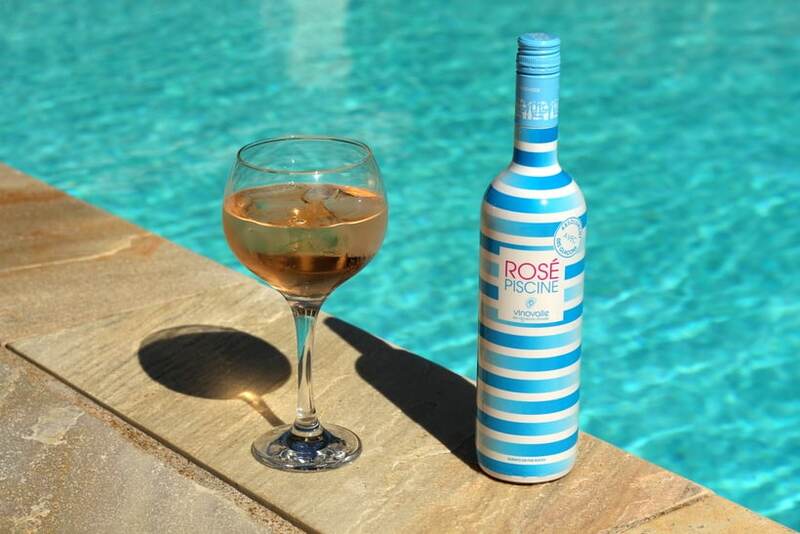 Rose Piscine is available in most large supermarkets in France, but for those of you in the USA, you’re in luck! All Oui In France readers in the USA get 25% off orders of Rose Piscine right here on their website with coupon code OUIFRANCE at checkout. Grab a couple of bottles and let me know what you think. P.P.S. Thanks to Rose Piscine for extending a generous coupon code to Oui In France readers! 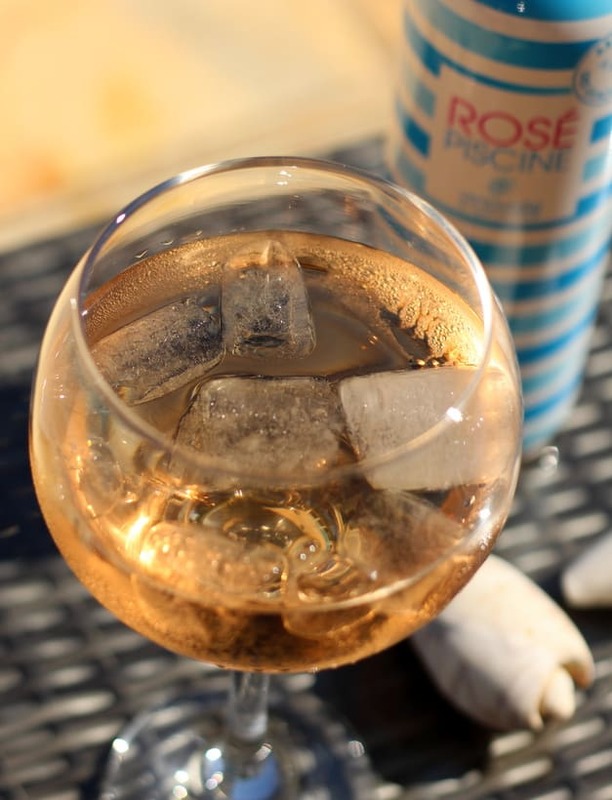 Quite a few of my French friends add ice cubes to white or rosé wine because they want to water it down, because they have to drive or because it’s hot and they don’t want to drink too fast. This has a history: back in the day, water came from wells and sometimes tasted funny. So people would mix in wine to cover the taste. But also, if you’re working in fields or vineyards under the summer sun, you can’t drink straight wine at lunch–so they would water it down. Not to be done with a fine wine, but why not with a table wine? I understand… Rose Piscine might surprise you though! Just received my two bottles. Fast delivery via Fedex in 2 days. Best packaging ever. Will taste on Saturday as I am having a party. Will order more if consensus is favorable. The bottle will be a souvenir when empty, so colorful and unique. 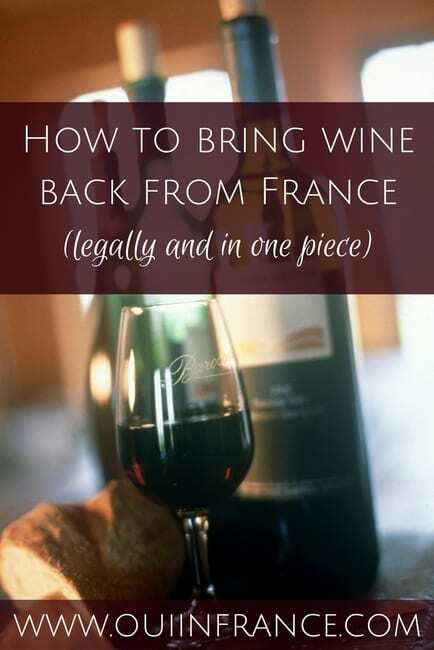 Thanks Ouiinfrance for making me aware of this offering…. You made me really curious about the Rose Piscine. You said it’s available in the USA? Gotta look for it when I get back.